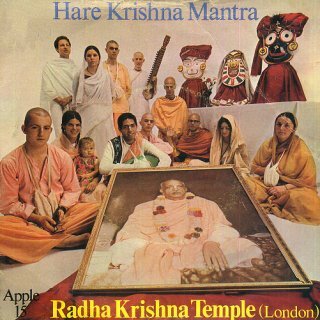 In the summer of 1969, before the dissolution of the Beatles, the most popular music group of all time, George Harrison produced a hit single, The Hare Krishna Mantra, performed by George and the devotees of the London Radha-Krishna Temple. 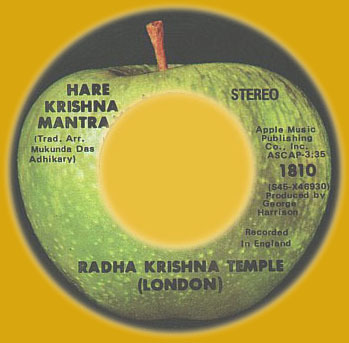 Soon after rising to the Top 10 or Top 20 best-selling record charts throughout England, Europe, and parts of Asia, the Hare Krishna chant became a household word--especially in England, where the BBC had featured the Hare Krishna Chanters, as they were then called, four times on the country's most popular television program, Top of the Pops. "John and Yoko, Timmy Leary, Rosemary, Tommy Smothers, Bobby Dylan, Tommy Cooper, Derek Taylor, Norman Mailer, Allen Ginsberg, Hare Krishna, Hare Krishna. All we are saying is give peace a chance." George Harrison was the impetus for the Beatles'spiritual quest of the sixties, and today, nearly fifteen years later, the chanting of the Hare Krishna maha-mantra--Hare Krishna, Hare Krishna. Krishna Krishna, Hare Hare/ Hare Rama, Hare Rama, Rama Rama, Hare Hare--still plays a key role in the former Beatle's life. In this conversation, taped at George's home in England on September 4, 1982, George reveals some memorable experiences he has had chanting Hare Krishna and describes in detail his deep personal realizations about the chanting. He reveals what factors led him to produce "The Hare Krishna Mantra" record, "My Sweet Lord," and the LPs All Things Must Pass and Living in the Material World, which were all influenced to a great extent by the Hare Krishna chanting and philosophy. He speaks lovingly and openly about his association with His Divine Grace A. C. Bhaktivedanta Swami Prabhupada, Founder-Acarya (spiritual master) of the Hare Krishna movement. In the following interview George speaks frankly about his personal philosophy regarding the Hare Krishna movement, music, yoga, reincarnation, karma, the soul, God, and Christianity. The conversation concludes with his fond remembrances of a visit to the birthplace of Lord Krishna in Vrndavana, India, home of the Hare Krishna mantra, and with George discussing some of his celebrity friends' involvement with the mantra now heard and chanted around the world. Mukunda Goswami: Oftentimes you speak of yourself as a plainclothes devotee, a closet yogi or "closet Krishna," and millions of people all over the world have been introduced to the chanting by your songs. But what about you? How did you first come in contact with Krishna? George Harrison: Through my visits to India. So by the time the Hare Krishna movement first came to England in 1969, John and I had already gotten ahold of Prabhupada's first album, Krishna Consciousness. (SIDE A / SIDE B) We had played it a lot and liked it. That was the first time I'd ever heard the chanting of the maha-mantra. Mukunda: Even though you and John Lennon played Srila Prabhupada's record a lot and had chanted quite a bit on your own, you'd never really met any of the devotees. Yet when Gurudasa, Syamasundara, and I [the first Hare Krishna devotees sent from America, to open a temple in London] first came to England, you co-signed the lease on our first temple in central London, bought the Manoryoga-aSrama* for us, which has provided a place for literally hundreds of thousands of people to learn about Krishna consciousness, and financed the first printing of the book Krishna. You hadn't really known us for a very long time at all. Wasn't this a kind of sudden change for you? George: Not really, for I always felt at home with Krishna. You see it was already a part of me. I think it's something that's been with me from my previous birth. Your coming to England and all that was just like another piece of a jigsaw puzzle that was coming together to make a complete picture. It had been slowly fitting together. That's why I responded to you all the way I did when you first came to London. Let's face it. If you're going to have to stand up and be counted, I figured, "I would rather be with these guys than with those other guys over there." It's like that. I mean I'd rather be one of the devotees of God than one of the straight, so-called sane or normal people who just don't understand that man is a spiritual being, that he has a soul. And I felt comfortable with you all, too, kind of like we'd known each other before. It was a pretty natural thing, really. Mukunda: George, you were a member of the Beatles, undoubtedly the greatest single pop group in music hisiory, one that influenced not only music, but whole generations of young people as well. After the dissolution of the group, you went on to emerge as a solo superstar with albums like All Things Must Pass, the country's top selling album for seven weeks in a row, and its hit single "My Sweet Lord," which was number one in America for two months. That was followed by Living in the Material World, number one on Billboard for five weeks and a million-selling LP. One song on that album, "Give Me Love," was a smash hit for six straight weeks. The concert for Bangladesh with Ringo Starr, Eric Clapton, Bob Dylan, Leon Russell, and Billy Preston was a phenomenal success and, once the LP and concert film were released, would become the single most successful rock benefit project ever. So, you had material success. You'd been everywhere, done everything, yet at the same time you were on a spiritual quest. What was it that really got you started on your spiritual journey? George: It wasn't until the experience of the sixties really hit. You know, having been successful and meeting everybody we thought worth meeting and finding out they weren't worth meeting, and having had more hit records than everybody else and having done it bigger than everybody else. It was like reaching the top of a wall and then looking over and seeing that there's so much more on the other side. So I felt it was part of my duty to say, "Oh, okay, maybe you are thinking this is all you need-to be rich and famous--but actually it isn't." Mukunda: George, in your recently published autobiography, I, Me, Mine, you said your song "Awaiting on You All" is about japa-yoga, or chanting mantras on beads. You explained that a mantra is "mystical energy encased in a sound structure," and that "each mantra contains within its vibrations a certain power." But of all mantras, you stated that "the maha-mantra [the Hare Krishna mantra] has been prescribed as the easiest and surest way for attaining God Realization in this present age." As a practitioner of japa-yoga, what realizations have you experienced from chanting? George: Prabhupada, acarya (spiritual master) of the Hare Krishna movement, told me once that we should just keep chanting all the time, or as much as possible. Once you do that, you realize the benefit. The response that comes from chanting is in the form of bliss, or spiritual happiness, which is a much higher taste than any happiness found here in the material world. That's why I say that the more you do it, the more you don't want to stop, because it feels so nice and peaceful. George: The word Hare is the word that calls upon the energy that's around the Lord. If you say the mantra enough, you build up an identification with God. God's all happiness, all bliss, and by chanting His names we connect with Him. So it's really a process of actually having a realization of God, which all becomes clear with the expanded state of consciousness that develops when you chant. Like I said in the introduction I wrote for Prabhupada's Krsna book some years ago, "If there's a God, I want to see Him. It's pointless to believe in something without proof, and Krishna consciousness and meditation are methods where you can actually obtain God perception." 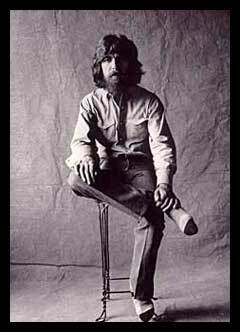 George: In the life I lead, I find that I sometimes have opportunities when I can really get going at it, and the more I do it, I find the harder it is to stop, and I don't want to lose the feeling it gives me. For example, once I chanted the Hare Krishna mantra all the way from France to Portugal, nonstop. I drove for about twenty-three hours and chanted all the way. It gets you feeling a bit invincible. The funny thing was that I didn't even know where I was going. I mean I had bought a map, and I knew basically which way I was aiming, but I couldn't speak French, Spanish, or Portuguese. But none of that seemed to matter. You know, once you get chanting, then things start to happen transcendentally. George: It takes a certain amount of time and faith to accept or to realize that there is no difference between Him and His name, to get to the point where you're no longer mystified by where He is. You know, like, "Is He around here?" You realize after some time, "Here He is--right here!" It's a matter of practice. 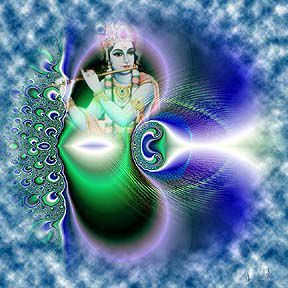 So when I say that "l see God," I don't necessarily mean to say that when I chant I'm seeing Krishna in His original form when He came five thousand years ago, dancing across the water, playing His flute. Of course, that would also be nice, and it's quite possible too. When you become real pure by chanting, you can actually see God like that, I mean personally. But no doubt you can feel His presence and know that He's there when you're chanting. George: Before meeting Prabhupada and all of you, I had bought that album Prabhupada did in New York . (SIDE A / SIDE B) , and John and I listened to it. I remember we sang it for days, John and I, with ukulele banjos, sailing through the Greek Islands chanting Hare Krishna. Like six hours we sang, because we couldn't stop once we got going. As soon as we stopped, it was like the lights went out. It went on to the point where our jaws were aching, singing the mantra over and over and over and over and over. We felt exalted; it was a very happy time for us. Mukunda: You know, I saw a video the other day sent to us from Canada, showing John and Yoko Ono recording their hit song "Give Peace a Chance," and about five or six of the devotees were there in John's room at the Queen Elizabeth Hotel in Montreal, singing along and playing cymbals and drums. You know, John and Yoko chanted Hare Krishna on that song. That was in May of '69, and just three months later, Srila Prabhupada was John and Yoko's house guest for one month at their estate outside London. Mukunda: At that point John was a spiritual seeker, and Prabhupada explained the true path to peace and liberation. 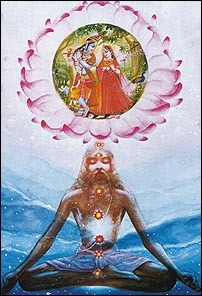 He talked about the eternality of the soul, karma, and reincarnation, which are all elaborately dealt with in the Vedic literatures.Vedas, predating the Bible and covering all aspects of spiritual knowledge from the nature of the self, or individual soul, to the Supreme Soul (Sri Krishna) and His kingdom in the spiritual world. Although John never made Hare Krishna a big part of his life, he echoed the philosophy of Krishna consciousness in a hit song he wrote just about a year after that conversation, "Instant Karma." Now what's the difference between chanting Hare Krishna and meditation? George: It's really the same sort of thing as meditation, but I think it has a quicker effect. I mean, even if you put your beads down, you can still say the mantra or sing it without actually keeping track on your beads. One of the main differences between silent meditation and chanting is that silent meditation is rather dependent on concentration, but when you chant, it's more of a direct connection with God. Mukunda: The maha-mantra was prescribed for modern times because of the fast-paced nature of things today. Even when people do get into a little quiet place, it's very difficult to calm the mind for very long. George: That's right. Chanting Hare Krishna is a type of meditation that can be practiced even if the mind is in turbulence. You can even be doing it and other things at the same time. That's what's so nice. In my life there's been many times the mantra brought things around. It keeps me in tune with reality, and the more you sit in one place and chant, the more incense you offer to Krishna in the same room, the more you purify the vibration, the more you can achieve what you're trying to do, which is just trying to remember God, God, God, God, God, as often as possible. And if you're talking to Him with the mantra, it certainly helps. George: Well, just having as many things around me that will remind me of Him, like incense and pictures. Just the other day I was looking at a small picture on the wall of my studio of you, Gurudasa, and Syamasundara, and just seeing all the old devotees made me think of Krishna. I guess that's the business of devotees--to make you think of God. Mukunda: Once you asked Srila Prabhupada about a particular verse he quoted from the Vedas, in which it's said that when one chants the holy name of Krishna, Krishna dances on the tongue and one wishes one had thousands of ears and thousands of mouths with which to better appreciate the holy names of God. George: Yes. I think he was talking about the realization that there is no difference between Him standing before you and His being present in His name. That's the real beauty of chanting--you directly connect with God. 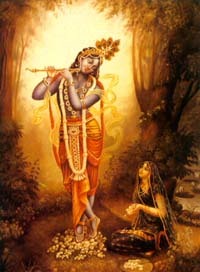 I have no doubt that by saying Krishna over and over again, He can come and dance on the tongue. The main thing, though, is to keep in touch with God. George: Oh, yeah. I have my beads. I remember when I first got them, they were just big knobby globs of wood, but now I'm very glad to say that they're smooth from chanting a lot. George: Yes. I find it's very good to be touching them. It keeps another one of the senses fixed on God. Beads really help in that respect. You know, the frustrating thing about it was in the beginning there was a period when I was heavy into chanting and I had my hand in my bead bag all the time. And I got so tired of people asking me, "Did you hurt your hand, break it or something?" In the end I used to say, "Yeah. Yeah. I had an accident," because it was easier than explaining everything. Using the beads also helps me to release a lot of nervous energy. Mukunda: Some people say that if everyone on the planet chanted Hare Krishna, they wouldn't be able to keep their minds on what they were doing. In other words, if everyone started chanting, some people ask if the whole world wouldn't just grind to a halt. They wonder if people would stop working in factories, for example. George: No. Chanting doesn't stop you from being creative or productive. It actually helps you concentrate. I think this would make a great sketch for television: imagine all the workers on the Ford assembly line in Detroit, all of them chanting Hare Krishna Hare Krishna while bolting on the wheels. Now that would be wonderful. It might help out the auto industry, and probably there would be more decent cars too. Mukunda: We've talked a lot about japa, or personalized chanting, which most chanters engage in. But there's another type, called kirtana, when one chants congregationally, in a temple or on the streets with a group of devotees. Kirtana generally gives a more supercharged effect, like recharging one's spiritual batteries, and it gives others a chance to hear the holy names and become purified. Actually, I was with Srila Prabhupada when he first began the group chanting in Tompkins Square Park on New York's Lower East Side in 1966. The poet Allen Ginsberg would come and chant with us a lot and would play on his harmonium. A lot of people would come to hear the chanting, then Prabhupada would give lectures on Bhagavad-gita back at the temple. 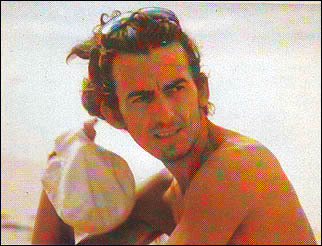 George: Yes, going to a temple or chanting with a group of other people--the vibration is that much stronger. Of course, for some people it's easy just to start chanting on their beads in the middle of a crowd, while other people are more comfortable chanting in the temple. But part of Krishna consciousness is trying to tune in all the senses of all the people: to experience God through all the senses, not just by experiencing Him on Sunday, through your knees by kneeling on some hard wooden kneeler in the church. But if you visit a temple, you can see pictures of God, you can see the Deity form of the Lord, and you can just hear Him by listening to yourself and others say the mantra. It's just a way of realizing that all the senses can be applied toward perceiving God, and it makes it that much more appealing, seeing the pictures, hearing the mantra, smelling the incense, flowers, and so on. That's the nice thing about your movement. It incorporates everything--chanting, dancing, philosophy, and prasadam. The music and dancing is a serious part of the process too. It's not just something to burn off excess energy. Mukunda: We've always seen that when we chant in the streets, people are eager to crowd around and listen. A lot of them tap their feet or dance along. George: It's great, the sound of the karatalas [cymbals]. When I hear them from a few blocks away, it's like some magical thing that awakens something in me. Without their really being aware of what's happening, people are being awakened spiritually. Of course, in another sense, in a higher sense, the kirtana is always going on, whether we're hearing it or not. Now, all over the place in Western cities, the sankirtana party has become a common sight. I love to see these sankirtana parties, because I love the whole idea of the devotees mixing it up with everybody, giving everybody a chance to remember. 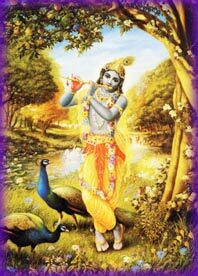 I wrote in the Krsna book introduction, "Everybody is looking for Krishna. Some don't realize that they are, but they are. Krishna is God ... and by chanting His Holy Names, the devotee quickly develops God-consciousness." Mukunda: You know, Srila Prabhupada often said that after a large number of temples were established, most people would simply begin to take up the chanting of Hare Krishna within their own homes, and we're seeing more and more that this is what's happening. Our worldwide congregation is very large--in the millions. The chanting on the streets, the books, and the temples are there to give people a start, to introduce them to the process. George: I think it's better that it is spreading into the homes now. There are a lot of "closet Krishnas," you know. There's a lot of people out there who are just waiting, and if it's not today, it will be tomorrow or next week or next year. Back in the sixties, whatever we were all getting into, we tended to broadcast it as loud as we could. I had had certain realizations and went through a period where I was so thrilled about my discoveries and realizations that I wanted to shout and tell it to everybody. But there's a time to shout it out and a time not to shout it out. A lot of people went underground with their spiritual life in the seventies, but they're out there in little nooks and crannies and in the countryside, people who look and dress straight, insurance salesmen types, but they're really meditators and chanters, closet devotees. Prabhupada's movement is doing pretty well. It's growing like wildfire really. How long it will take until we get to a Golden Age where everybody's perfectly in tune with God's will, I don't know; but because of Prabhupada, Krishna consciousness has certainly spread more in the last sixteen years than it has since the sixteenth century, since the time of Lord Caitanya. The mantra has spread more quickly and the movement's gotten bigger and bigger. It would be great if everyone chanted. Everybody would benefit by doing it. No matter how much money you've got, it doesn't necessarily make you happy. You have to find your happiness with the problems you have, not worry too much about them, and chant Hare Krishna, Hare Krishna, Krishna Krishna, Hare Hare. Mukunda: In 1969 you produced a single called "The Hare Krishna Mantra," which eventually became a hit in many countries. That tune later became a cut on the Radha-Krishna Temple album, which you also produced on the Apple label and was distributed in America by Capitol Records. A lot of people in the recording business were surprised by this, your producing songs for and singing with the Hare Krishnas. Why did you do it? George: Well, it's just all a part of service, isn't it? Spiritual service, in order to try to spread the mantra all over the world. Also, to try and give the devotees a wider base and a bigger foothold in England and everywhere else. Mukunda: What effect do you think that tune, "The Hare Krishna Mantra," having reached millions and millions of people, has had on the cosmic consciousness of the world? George: I'd like to think it had some effect. After all, the sound is God. George: I felt it was important to try and be precise, to tell them and let them know. You know, to come out of the closet and really tell them. Because once you realize something, then you can't pretend you don't know it any more. I figured this is the space age, with airplanes and everything. If everyone can go around the world on their holidays, there's no reason why a mantra can't go a few miles as well. So the idea was to try to spiritually infiltrate society, so to speak. After I got Apple Records committed to you and the record released, and after our big promotion, we saw it was going to become a hit. And one of the greatest things, one of the greatest thrills of my life, actually, was seeing you all on BBC's Top of the Pops. I couldn't believe it. It's pretty hard to get on that program, because they only put you on if you come into the Top 20. It was just like a breath of fresh air. My strategy was to keep it to a three-and-a-half-minute version of the mantra so they'd play it on the radio, and it worked. I did the harmonium and guitar track for that record at Abbey Road studios before one of the Beatles' sessions and then overdubbed a bass part. I remember Paul McCartney and his wife, Linda, arrived at the studio and enjoyed the mantra. Mukunda: Paul's quite favorable now, you know. George: That's good. It still sounds like quite a good recording, even after all these years. It was the greatest fun of all, really, to see Krishna on Top of the Pops. Mukunda: Shortly after its release, John Lennon told me that they played it at the intermission right before Bob Dylan did the Isle of Wight concert with Jimi Hendrix, the Moody Blues, and Joe Cocker in the summer of '69. George: They played it while they were getting the stage set up for Bob. It was great. Besides, it was a catchy tune, and the people didn't have to know what it meant in order to enjoy it. I felt very good when I first heard it was doing well. George: Yamuna, the lead singer, has a naturally good voice. I liked the way she sang with conviction, and she sang like she'd been singing it a lot before. It didn't sound like the first tune she'd ever sung. You know, I used to sing the mantra long before I met any of the devotees or long before I met Prabhupada, because I had his first record then for at least two years. When you're open to something it's like being a beacon, and you attract it. From the first time I heard the chanting, it was like a door opened somewhere in my subconscious, maybe from some previous life. Mukunda: In the Iyrics to that song "Awaiting on You All," from the All Things Must Pass album, you come right out front and tell people that they can be free from living in the material world by chanting the names of God. What made you do it? What kind of feedback did you get? George: At that time, nobody was committed to that type of music in the pop world. There was, I felt, a real need for that, so rather than sitting and waiting for somebody else, I decided to do it myself. A lot of times we think, "Well, I agree with you, but I'm not going to actually stand up and be counted. Too risky." Everybody is always trying to keep themselves covered, stay commercial, so I thought, just do it. Nobody else is, and I'm sick of all these young people just boogeying around, wasting their lives, you know. Also, I felt that there were a lot of people out there who would be reached. I still get letters from people saying, "I have been in the Krishna temple for three years, and I would have never known about Krishna unless you recorded the All Things Must Pass album." So I know, by the Lord's grace, I am a small part in the cosmic play. Mukunda: What about the other Beatles? What did they think about your taking up Krishna consciousness? What was their reaction? You'd all been to India by then and were pretty much searching for something spiritual. Syamasundara said that once, when he ate lunch with you and the other Beatles, they were all quite respectful. George: Oh, yeah, well, if the Fab Four didn't get it, that is, if they couldn't deal with shaven-headed Hare Krishnas, then there would have been no hope! [Laughter.] And the devotees just came to be associated with me, so people stopped thinking, "Hey, what's this?" you know, if somebody in orange, with a shaved head, would appear. They'd say, "Oh, yeah, they're with George." George: The first time I met Syamasundara, I liked him. He was my pal. I'd read about Prabhupada coming from India to Boston on the back of his record, and I knew that Syamasundara and all of you were in my age group, and that the only difference, really, was that you'd already joined and I hadn't. I was in a rock band, but I didn't have any fear, because I had seen dhotis, your robes, and the saffron color and shaved heads in India. Krishna consciousness was especially good for me because I didn't get the feeling that I'd have to shave my head, move into a temple, and do it full time. So it was a spiritual thing that just fit in with my life-style. I could still be a musician, but I just changed my consciousness, that's all. Mukunda: You know, the Tudor mansion and estate that you gave us outside London has become one of our largest international centers. 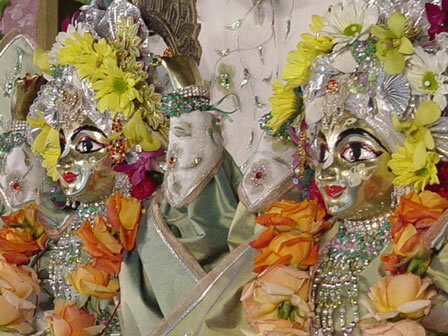 How do you feel about the Bhaktivedanta Manor's success in spreading Krishna consciousness? George: Oh, it's great. And it also relates to making the Hare Krishna record or whatever my involvements were. Actually, it gives me pleasure, the idea that I was fortunate enough to be able to help at that time. All those songs with spiritual themes were like little plugs--"My Sweet Lord" and the others. And now I know that people are much more respectful and accepting when it comes to seeing the devotees in the streets and all that. It's no longer like something that's coming from left field. George: I try to tell them my little bit, what my experience is, and give them a choice of things to read and a choice of places to go--like you know, "Go to the temple, try chanting." George: The media is to blame for everything, for all the misconceptions about the movement, but in a sense it didn't really matter if they said something good or bad, because Krishna consciousness always seemed to transcend that barrier anyway The fact that the media was letting people know about Krishna was good in itself. Mukunda: Srila Prabhupada always trained us to stick to our principles. He said that the worst thing we could ever do would be to make some sort of compromise or to dilute the philosophy for the sake of cheap popularity. Although many swamis and yogis had come from India to the West, Prabhupada was the only one with the purity and devotion to establish India's ancient Krishna conscious philosophy around the world on its own terms-not watered down, but as it is. George: I just felt like it was part of my job, you know. Wherever I go in the world, when I see devotees, I always say "Hare Krishna!" to them, and they're always pleased to see me. It's a nice relationship. Whether they really know me personally or not, they feel they know me. And they do, really. Mukunda: When you did the Material World album, you used a photo insert taken from the cover of Prabhupada's Bhagavad-gita showing Krishna and His friend and disciple, Arjuna. Why? George: Oh, yeah. It said on the album, "From the cover of Bhagavad-gita As It Is by A. C. Bhaktivedanta Swami." It was a promo for you, of course. 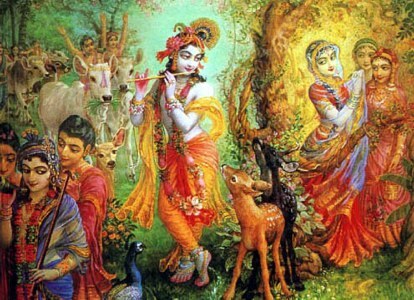 I wanted to give them all a chance to see Krishna, to know about Him. I mean that's the whole idea, isn't it? Mukunda: At lunch today we spoke a little about prasadam, vegetarian foods that have been spiritualized by being offered to Krishna. A lot of people have come to Krishna consciousness through prasadam.I mean, this process is the only kind of yoga that you can actually practice by eating. George: Well, we should try to see God in everything, so it helps so much having the food to taste. Let's face it, if God is in everything, why shouldn't you taste Him when you eat? I think that prasadam is a very important thing. Krishna is God, so He's absolute: His name, His form, prasadam, it's all Him. They say the way to a man's heart is through his stomach, so if you can get to a man's spirit soul by eating, and it works, why not do it? There's nothing better than having been chanting and dancing, or just sitting and talking philosophy, and then suddenly the devotees bring out the prasadam. It's a blessing from Krishna, and it's spiritually important. The idea is that prasadam is the sacrament the Christians talk about, only instead of being just a wafer, it's a whole feast, really, and the taste is so nice--it's out of this world. And prasadam's a good little hook in this age of commercialism. When people want something extra, or they need to have something special, prasadam will hook them in there. It's undoubtedly done a great deal toward getting a lot more people involved in spiritual life. It breaks down preju dices, too. Because they think, "Oh, well, yes, I wouldn't mind a drink of whatever or a bite of that." Then they ask, "What's this?" and "Oh, well, it's prasadam." And they get to learn another aspect of Krishna consciousness. Then they say, "It actually tastes quite nice. Have you got another plateful?" I've seen that happen with lots of people, especially older people I've seen at your temples. Maybe they were a little prejudiced, but the next thing you know, they're in love with prasadam, and eventually they walk out of the temple thinking, "They're not so bad after all." George: I'd say from my experience that it definitely works. I've always enjoyed prasadam much more when I've been at the temple, or when I've actually been sitting with Prabhupada, than when somebody's brought it to me. Sometimes you can sit there with prasadam and find that three or four hours have gone by and you didn't even know it. Prasadam really helped me a lot, because you start to realize "Now I'm tasting Krishna." You're conscious suddenly of another aspect of God, understanding that He's this little samosa. * It's all just a matter of tuning into the spiritual, and prasadam's a very real part of it all. Mukunda: You know, a lot of rock groups like Grateful Dead and Police get prasadam backstage before their concerts. They love it. It's a long-standing tradition with us. I remember one time sending prasadam to one of the Beatles' recording sessions. And your sister was telling me today that while you were doing the Bangladesh concert, Syamasundara used to bring you all prasadam at the rehearsals. George: Yes, he's even got a credit on the album sleeve. George: And one thing I always liked was rasamalai [a milk sweet]. And there's a lot of good drinks as well, fruit juices and lassi, the yogurt drinks mixed with fruit, and sometimes with rose water. Mukunda:You've been a vegetarian for years, George. Have you had any difficulties maintaining it? Mukunda: One of the things that really has a profound effect on people when they visit the temples or read our books is the paintings and sculptures done by our devotee artists of scenes from Krishna's pastimes when He appeared on earth five thousand years ago. Prabhupada once said that these paintings were "windows to the spiritual world," and he organized an art academy, training his disciples in the techniques for creating transcendental art. Now, tens of thousands of people have these paintings hanging in their homes, either the originals, lithographs, canvas prints, or posters. You've been to our multimedia Bhagavad-gita museum in Los Angeles. What kind of an effect did it have on you? George: I thought it was great--better than Disneyland, really. I mean, it's as valuable as that or the Smithsonian Institute in Washington. The sculpted dioramas look great, and the music is nice. It gives people a real feel for what the kingdom of God must be like, and much more basic than that, it shows in a way that's easy for even a child to understand exactly how the body is different from the soul, and how the soul's the important thing. I always have pictures around like the one of Krishna on the chariot that I put in the Material World album, and I have the sculpted Siva fountainBhagavad-gita museum, George asked if the artists and sculptors who had produced the museum could sculpt a life-sized fountain of Lord Siva, one of the principal Hindu demigods and a great devotee of Lord Krishna. Lord Siva, in a meditative pose, complete with a stream of water spouting from his head, now resides in the gardens of George's estate, heralded as among the most beautiful in all of England. the devotees made for me in my garden. Pictures are helpful when I'm chanting. You know that painting in the Bhagavad-gita of the Supersoul in the heart of the dog, the cow, the elephant, the poor man, and the priest? That's very good to help you realize that Krishna is dwelling in the hearts of everybody. It doesn't matter what kind of body you've got, the Lord's there with you. We're all the same really. George: The thing that always stays is his saying, "I am the servant of the servant of the servant." I like that. A lot of people say, "I'm it. I'm the divine incarnation. I'm here and let me hip you." You know what I mean? But Prabhupada was never like that. 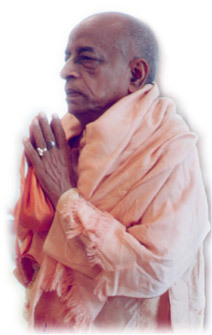 I liked Prabhupada's humbleness. I always liked his humility and his simplicity The servant of the servant of the servant is really what it is, you know. None of us are God--just His servants. He just made me feel so comfortable. I always felt very relaxed with him, and I felt more like a friend. I felt that he was a good friend. Even though he was at the time seventy-nine years old, working practically all through the night, day after day, with very little sleep, he still didn't come through to me as though he was a very highly educated intellectual being, because he had a sort of childlike simplicity. Which is great, fantastic. Even though he was the greatest Sanskrit scholar and a saint, I appreciated the fact that he never made me feel uncomfortable. In fact, he always went out of his way to make me feel comfortable. I always thought of him as sort of a lovely friend, really, and now he's still a lovely friend. George: And if I didn't get feedback from Prabhupada on my songs about Krishna or the philosophy, I'd get it from the devotees. That's all the encouragement I needed really. It just seemed that anything spiritual I did, either through songs, or helping with publishing the books, or whatever, really pleased him. The song I wrote, "Living in the Material World," as I wrote in I, Me, Mine, was influenced by Srila Prabhupada. He's the one who explained to me how we're not these physical bodies. We just happen to be in them. Srila Prabhupada has already had an amazing effect on the world. There's no way of measuring it. One day I just realized, "God, this man is amazing!" He would sit up all night translating Sanskrit into English, putting in glossaries to make sure everyone understands it, and yet he never came off as someone above you. He always had that childlike simplicity, and what's most amazing is the fact that he did all this translating in such a relatively short time--just a few years. And without having anything more than his own Krishna consciousness, he rounded up all these thousands of devotees, set the whole movement in motion, which became something so strong that it went on even after he left. And it's still escalating even now at an incredible rate. It will go on and on from the knowledge he gave. It can only grow and grow. The more people wake up spiritually, the more they'll begin to realize the depth of what Prabhupada was saying--how much he gave. George: They should be! One of the greatest things I noticed about Prabhupada was the way he would be talking to you in English, and then all of a sudden he would say it to you in Sanskrit and then translate it back into English. It was clear that he really knew it well. His contribution has obviously been enormous from the literary point of view, because he's brought the Supreme Person, Krishna, more into focus. A lot of scholars and writers know the Gita, but only on an intellectual level. Even when they write "Krishna said...," they don't do it with the bhakti or love required. That's the secret, you know--Krishna is actually a person who is the Lord and who will also appear there in that book when there is that love, that bhakti. You can't understand the first thing about God unless you love Him. These big so-called Vedic scholars--they don't necessarily love Krishna, so they can't understand Him and give Him to us. But Prabhupada was different. --"The Lord Loves the One that Loves the Lord"
Have you heard that song "That Which I Have Lost" from my new album, Somewhere in England? It's right out of the Bhagavad-gita. In it I talk about fighting the forces of darkness, limitations, falsehood, and mortality. Mukunda: Yes, I like it. If people can understand the Lord's message in Bhagavad-gita, they can become truly happy. A lot of people, when they just get started in spiritual life, worship God as impersonal. What's the difference between worshiping Krishna, or God, in His personal form and worshiping His impersonal nature as energy or light? George: Life is like a piece of string with a lot of knots tied in it. The knots are the karma you're born with from all your past lives, and the object of human life is to try and undo all those knots. That's what chanting and meditation in God consciousness can do. Otherwise you simply tie another ten knots each time you try to undo one knot. That's how karma works. I mean, we're now the results of our past actions, and in the future we'll be the results of the actions we're performing now. A little understanding of "As you sow, so shall you reap" is important, because then you can't blame the condition you're in on anyone else. You know that it's by your own actions you're able to get more in a mess or out of one. It's your own actions that relieve or bind you. Mukunda: In the Srimad-Bhagavatam, the crest jewel of all the Vedic literatures, it's described how those pure souls who live in the spiritual world with God have different types of rasas, or relationships, with Him. Is there any special way you like to think of Krishna? George: I like the idea of seeing Krishna as a baby, the way He's often depicted in India. And also Govinda, the cowherd boy. I like the idea that you can have Krishna as a baby and feel protective to Him, or as your friend, or as the guru or master--type figure. Mukunda: I don't think it's possible to calculate just how many people were turned on to Krishna consciousness by your song "My Sweet Lord." But you went through quite a personal thing before you decided to do that song. In your book you said, "I thought a lot about whether to do 'My Sweet Lord' or not because I would be committing myself publicly ... Many people fear the words Lord and God ... I was sticking my neck out on the chopping block ... but at the same time I thought 'Nobody's saying it ... why should I be untrue to myself?' I came to believe in the importance that if you feel something strong enough, then you should say it. "I wanted to show that Hallelujah and Hare Krishna are quite the same thing. I did the voices singing 'Hallelujah' and then the change to 'Hare Krishna' so that people would be chanting the maha-mantra-before they knew what was going on! I had been chanting Hare Krishna for a long time, and this song was a simple idea of how to do a Western pop equivalent of a mantra which repeats over and over again the holy names. I don't feel guilty or bad about it; in fact it saved many a heroin addict's life." Why did you feel you wanted to put Hare Krishna on the album at all? Wouldn't "Hallelujah" alone have been good enough? George: Well, first of all "Hallelujah" is a joyous expression the Christians have, but "Hare Krishna" has a mystical side to it. It's more than just glorifying God; it's asking to become His servant. And because of the way the mantra is put together, with the mystic spiritual energy contained in those syllables, it's much closer to God than the way Christianity currently seems to be representing Him. Although Christ in my mind is an absolute yogi, I think many Christian teachers today are misrepresenting Christ. They're supposed to be representing Jesus, but they're not doing it very well. They're letting him down very badly, and that's a big turn off. George: When I first came to this house, it was occupied by nuns. I brought in this poster of Visnu [a four-armed form of Krishna]. You just see His head and shoulders and His four arms holding a conchshell and various other symbols, and it has a big om. This transcendental syllable, which represents Krishna, has been chanted by many persons throughout history for spiritual perfection. * written above it. He has a nice aura around Him. I left it by the fireplace and went out into the garden. When we came back in thc house, they all pounced on me, saying, "Who is that? What is it?" as if it were some pagan god. So I said, "Well, if God is unlimited, then He can appear in any form, whichever way He likes to appear. That's one way. He's called Visnu." It sort of freaked them out a bit, but the point is, why should God be limited? Even if you get Him as Krishna, He is not limited to that picture of Krishna. He can be the baby form, He can be Govinda and manifest in so many other well-known forms. You can see Krishna as a little boy, which is how I like to see Krishna. It's a joyful relationship. But there's this morbid side to the way many represent Christianity today, where you don't smile, because it's too serious, and you can't expect to see God--that kind of stuff. If there is God, we must see Him, and I don't believe in the idea you find in most churches, where they say, "No, you're not going to see Him. He's way up above you. Just believe what we tell you and shut up." I mean, the knowledge that's given in Prabhupada's books--the Vedic stuff--that's the world's oldest scriptures. They say that man can become purified, and with divine vision he can see God. You get pure by chanting, then you see Him. And Sanskrit, the language they're written in, is the world's first recorded language. Devanagari [the alphabet of the Sanskrit language] actually means "language of the gods." Mukunda: Anyone who is sincere about making spiritual advancement, whatever one's religion may be, can usually see the value of chanting. I mean if that person was really trying to be God conscious and trying to chant sincerely. George: That's right. It's a matter of being open. Anyone who's open can do it. You just have to be open and not prejudiced. You just have to try it. There's no loss, you know. But the "intellectuals" will always have problems, because they always need to "know." They're often the most spiritually bankrupt people, because they never let go; they don't understand the meaning of "to transcend" the intellect. But an ordinary person's more willing to say, "Okay. Let me try it and see if it works." Chanting Hare Krishna can make a person a better Christian, too. Mukunda: In I, Me, Mine, you speak about karma and reincarnation, and how the only way to get out of the cycle is to take up a bona fide spiritual process. You said at one point, "Everybody is worried about dying, but the cause of death is birth, so if you don't want to die, you don't get born!" Did any of the other Beatles believe in reincarnation? George: I'm sure John does! And I wouldn't want to underestimate Paul and Ringo. I wouldn't be surprised if they're hoping it's true, you know what I mean? For all I know, Ringo might be a yogi disguised as a drummer! Mukunda: Paul has our latest book, Coming Back: The Science of Reincarnation. Where do you think John's soul is now? George: I should hope that he's in a good place. He had the understanding, though, that each soul reincarnates until it becomes completely pure, and that each soul finds its own level, designated by reactions to its actions in this and previous lives. George: That's right. He said he enjoyed the chanting and being with them. Also Stevie Wonder had you on one of his records, you know. And it was great the song he put the chanting in--"Pastimes Paradise." Mukunda: When you were in Vrndavana, India, where Lord Krishna appeared, and you saw thousands of people chanting Hare Krishna, did it strengthen your faith in the idea of chanting to see a whole city living Hare Krishna? George: Yeah, it fortifies you. It definitely helps. It's fantastic to be in a place where the whole town is doing it. And I also had the idea that they were all knocked out at the idea of seeing some white person chanting on beads. Vrndavana is one of the holiest cities in India. Everyone, everywhere, chants Hare Krishna. It was my most fantastic experience. George: That's right. Unless you're doing some kind of God conscious thing and you know that He's the one who's really in charge, you're just building up a lot of karma and not really helping yourself or anybody else. There's a point in me where it's beyond sad, seeing the state of the world today. It's so screwed up. It's terrible, and it will be getting worse and worse. More concrete everywhere, more pollution, more radioactivity. There's no wilderness left, no pure air. They're chopping the forests down. They're polluting all the oceans. In one sense, I'm pessimistic about the future of the planet. These big guys don't realize for everything they do, there's a reaction. You have to pay. That's karma. George: All right. Hare Krishna!